The mid-term conference was dedicated to discussing the results of the first year analysis of large data sets by the teams in Essex, Oxford, and Utrecht concerning the mobility flows in Europe, reasons to emigrate and forms and levels of labour market integration. 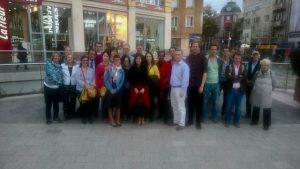 The Bulgarian team coordinated the activities within WP4 вЂ“ The lived experiences of migration. The work on this task has just started, so the meeting of the 6 participating country teams was focused on the design of the sample and the interview guides. Three type of guides were discussed and accepted вЂ“ for interviewing of experts from recruiting agencies, prospective migrants and actual migrants. The Bulgarian team will have to interview ten experts and ten prospective migrants in Bulgaria and 8 migrants in each of the four receiving countries: Germany, the UK, Spain and Italy. The migrants will be mostly highly qualified in medicine, finance and information and communication technology. The interviews will be transcribed, coded and analysed and will serve as a basis for six national reports and two comparative cross-country reports.